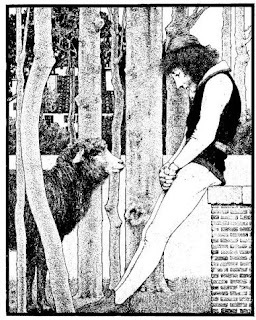 Note: all the links inside this post are places to read the books online for free, such as Project Gutenberg. I have an Amazon widget at the bottom if you would like links to hard copies. Aren't public domain books wonderful? One of my very favorite books from my childhood is a tattered old copy of Ozma of Oz, by L. Frank Baum. I still have it, and I love reading it. My first memory of the Land of Oz was from watching the movie with Judy Garland–and, incidentally, holds the dubious honor of being the number one non-animated movie that causes nightmares for children. I did not, of course, discover this until after I let my girls watch it. This is one event in a long list why I have not yet received the Mother of the Year award, I fear. Anyway, I have thoroughly enjoyed reading any and all of the Oz books I've come across. Several years ago, I found some brand new hardcover copies of several of the books at a lovely second-hand bookstore in Michigan called Chapter Two. They're no longer there, sadly, but I got lots of books while the fun lasted, and those were my favorite purchases. They have "emerald" ink in some of the illustrations, which means green ink with glitter, and was apparently quite the thing when they first used it. 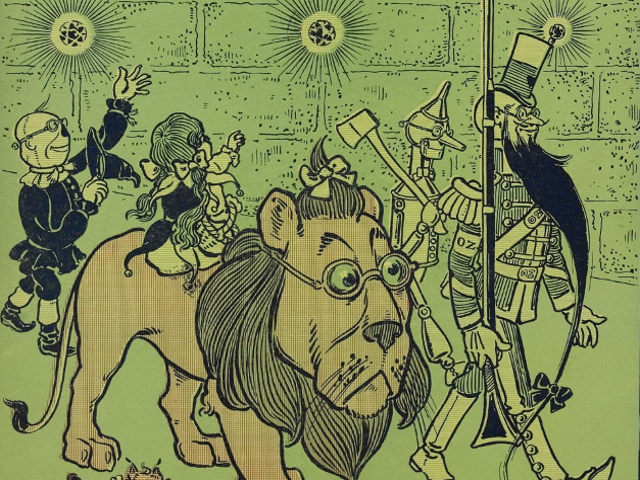 L. (Lyman) Frank Baum was born in New York in 1856. He never lived in Kansas. Can you believe that? Well, I suppose you might if you lived in Kansas. He based his descriptions of that state on his experiences living in South Dakota. It's hard for me to imagine The Wizard of Oz being based in South Dakota, but I do wonder what made him choose Kansas. He was in theater for a while, wrote for a newspaper for a while, and was a traveling salesman. His first book was Mother Goose in Prose, illustrated by Maxwell Parrish, and NOT the Wizard! I skimmed through it a bit while I was looking up the link (Project Gutenberg) and I'm going to have to read it more closely. It looks like a lot of fun. 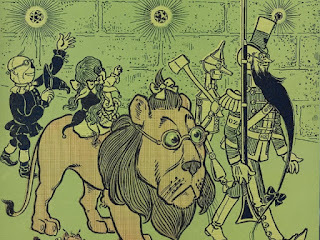 After his Mother Goose book, he partnered with William Wallace Denslow, who illustrated his Father Goose:His Book, a book of nonsense rhymes, and who then also illustrated The Wonderful Wizard of Oz. I thought Baum illustrated his own books, so this was a surprise to me. the book was first published in 1900, and according to Wikipedia, was the top selling children's book for 2 years, and sold 3 million copies by the time it entered the public domain in 1952. If you're interested in Frank Baum trivia, here's a list of interesting facts. Besides Ozma, I loved Tik-tok of Oz, about a clockwork man Betsy Bobbin rescued after she and her mule, Hank, are washed ashore on Oz. My sweet husband bought me a beautiful boxed set of 5 hardcover books (linked in widget below) containing all the Oz stories. I'm so excited to read them all! I have never worked my way through them all. What do you think of the Oz books?